This page contains links to audio and video memories of our class that we've uploaded to our YouTube channel and video that appears on East Longmeadow Community Access Television. 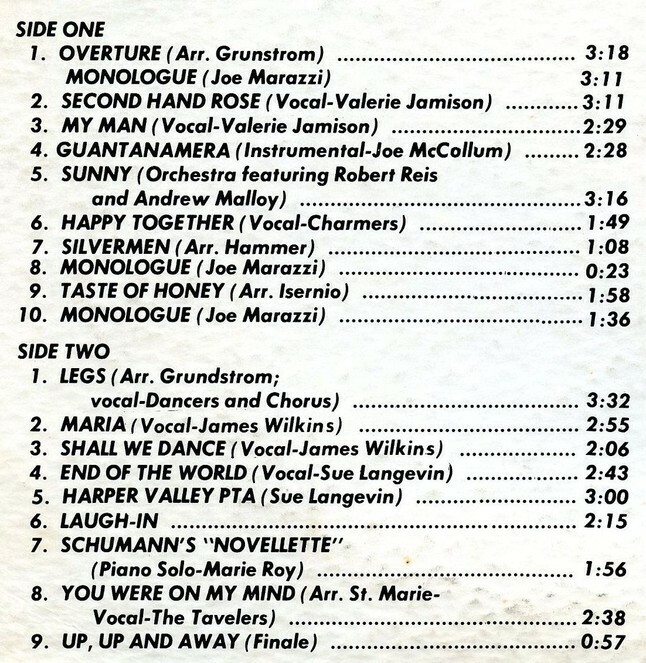 In 1969, Mr. Walter Gonet, WG Records, Holyoke MA, made a stereo record of the 1969 Spartanum Spectaculum show, featuring many of our classmates. Most of the music was arranged by ELHS 1964 graduate Mr. Roy Grundstrom, who passed away in 2012. A Taste of Honey was arranged by Mr. Robert Isernio, a local musician and You Were on My Mind by classmate Steve St. Marie. Below are links to all the tracks on our youtube.com channel. 3. My Man --- vocal by Valerie Jamison; Bob Ireland's french horn solo, floating above the melody, perfectly complements Valerie's voice. 6. Happy Together --- vocal by Charmers. Charmers members: Susan Garner, Ellen Hopkins, Amelia Ingram, Valerie Jamison, Lois Melbourne, and Susan Regnier. 7. Silvermen --- master of ceremonies Joe Marazzi introduces the Silvermen's tableau on "Love"
9. Up, Up and Away --- master of ceremonies Joe Marazzi closes the show; pit orchestra plays portion of "Up, Up and Away"
From the record album's back cover. Filmed by Mr. Ed Willard, father of Kris '67, Bob '69, Rick '70, Rand '74, and Ray '76. 2. Parents' Day 1968 - football highlights (Note: this video is viewable using the Google Chrome browser but is not viewable using the Microsoft Edge browser). 3. Game Day 1968 (Note: this video is viewable using the Google Chrome browser but is not viewable using the Microsoft Edge browser). ELHS 50th Birthday Party Highlights - From July 1 - 4, 2011, East Longmeadow High School held a birthday party to celebrate its first fifty years. Over 800 alumni, faculty, and guests attended a variety of events. See the ELHS 50th Birthday page for a complete report.